The popular Family Tissue Box Cover is now available in a different style, with a loose lid! The Family Tissue Box cover is made from high quality pine based MDF, and sanded for that perfect finish. Leather/leatherette Rectangular Tissue Box Cover, Size: L - 10" W - 5.25" X H - 2.75"
Size: L - 10" w - 5.25" X H - 2.75"
Hand Embroidered Tissue Box Covers offered by us are manufactured using premium quality fabric. These are available in various sizes, shapes, colors and embroideries. Our enticing gamut of Hand Embroidered Tissue Box Covers are known for offering both traditional and contemporary look. These are used in both household as well as commercial sectors. The popular MDF Wooden Family Tissue Box can be perfectly coordinated with the soft furnishings in your room. 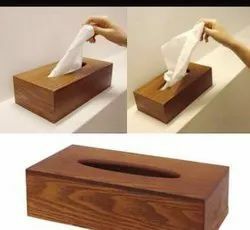 Specifications: To keep tissue papers. - Care Instructions: Spot Cleaning. - Dimension: 5.25" L x 10.75" W x 3"H.
Tissue Box Cover is used to wrap the tissue boxes to protect them from dust, etc. Our Tissue Box Covers are available in a wide variety, which is designed as per the latest market trends. We are a renowned Tissue Box Cover Manufacturer, Exporter, and Supplier in Tamil Nadu. Our Tissue Box Cover is offered in different sizes and designs. SS Shawls is a famous quality mark for Tisshu Box Cover, New innovative designs in introduced to match the international trend and tastes. - Beautiful white vintage handmade paper Tissue Box Cover for your Home or Office. - The cotton is up cycled and the water is recycled. We commence our business as the leading organization of the best quality Tissue Box Holder.